Nickelodeon Toddler Boy's PAW Patrol Red/Yellow Plush Slipper Just $4.89! Down From $14.99! You are here: Home / Great Deals / Nickelodeon Toddler Boy’s PAW Patrol Red/Yellow Plush Slipper Just $4.89! Down From $14.99! Nickelodeon Toddler Boy’s PAW Patrol Red/Yellow Plush Slipper Just $4.89! Down From $14.99! 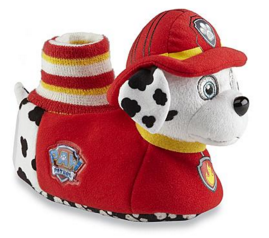 Sears has this Nickelodeon Toddler Boy’s PAW Patrol Red/Yellow Plush Slipper on sale for $4.89 (Reg. $14.99)! These cozy PAW Patrol slippers are exactly what you have been searching for. With a sweater cuff design, they will stay put on your little one’s feet, keeping him warm even in the chilly winter months.